Number of Territories: 118 like the actual table. Special Features: Up to 12 players, random start with lots of neutrals. What Makes This Map Worthy of Being Made: If you went to Middle School your familiar with The Periodic Table of the Elements. Colorful, interesting and packed with information. 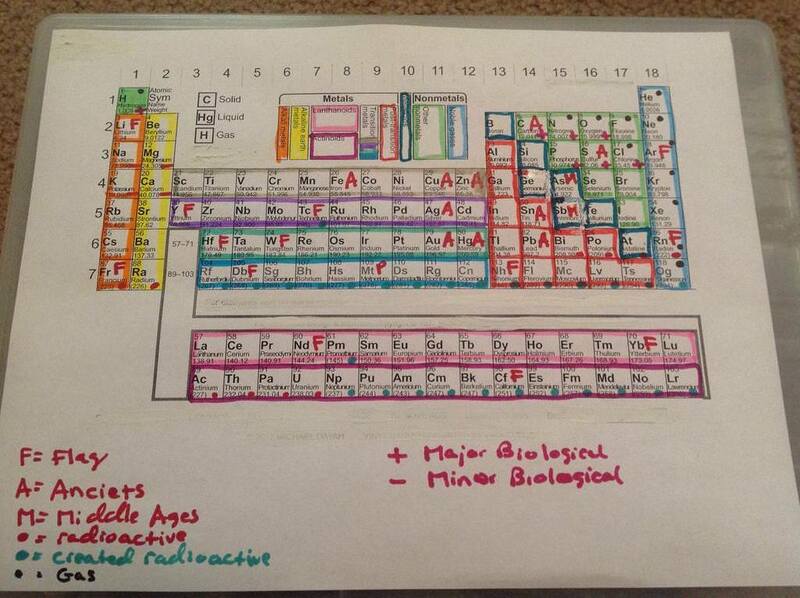 Simple standard bonuses such as Noble Gases, Rare Earth Metals, Halogens and Transition Metals. New bonuses like Nuclear (marked with the nuclear symbol), Known to the Ancients (with the Stonehenge symbol) Nation of Discovery (showing the corresponding national flag) and Magnetics with the horseshoe symbol. PTE V.6 Just want to keep the ball rolling. EBConquer will still be the designer as the skill level needed is high. Also, 14 of the elements will have the national flag of the country that discovered it. United Kingdom, United States, Sweden, Germany, Russia, Austria, Denmark, France, Japan, Italy, Spain, Finland and the now defunked Austria Habsburg. I would like the flags to look real like the Spanish image. Focused in and angled. The Finland flag looks good also. Last edited by HitRed on Thu Apr 04, 2019 12:24 pm, edited 130 times in total. 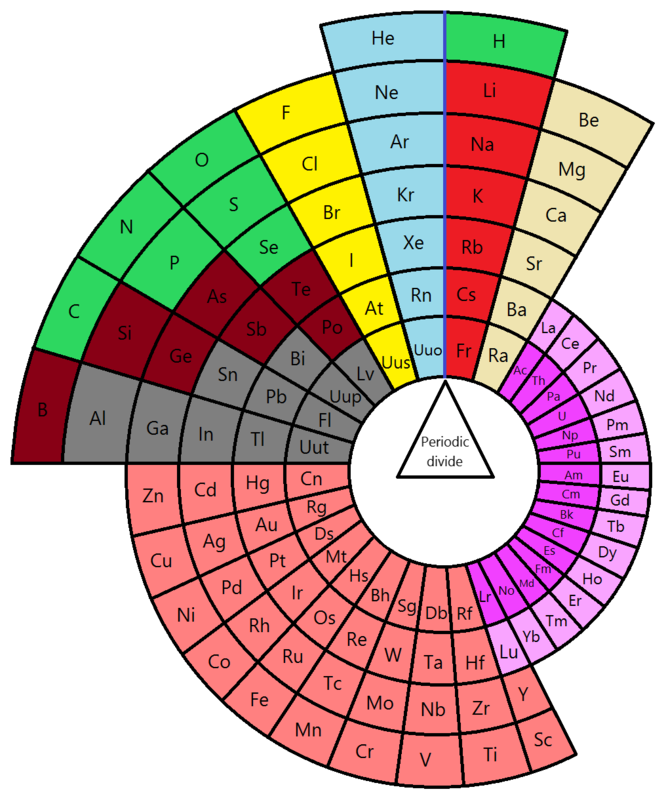 Wikipedia, The Royal Society of Chemistry, and the deadicated website PTable all show different groupings on the right side of the chart. There are also very strong differences in discovery date, nation of discovery, and type of matter. So, all this will be decided (by one creative cow) using fun and enjoyable gameplay. Purists will be redirected to this post. Last edited by HitRed on Mon Jan 15, 2018 12:49 am, edited 1 time in total. The elements in the Lanthanoid series have all the coolest name. Gadolinium. Praseodymium. Ytterbium. Dysprosium. I love saying those names. All the other elements should hang their head in shame. They're boring. The Lanthanoids speak! Last edited by HitRed on Mon Jan 08, 2018 11:21 pm, edited 1 time in total. I voted for the square one, I'm used to see this one at school, not the others. I will be using the PTable as the basis. 118 is too large and complicated. To improve game play some areas will be grouped in twos or threes. Around 60-70 territories is the goal. Last edited by HitRed on Wed Jan 10, 2018 11:51 pm, edited 1 time in total. HitRed wrote: I will be using the PTable as the basis. 118 is too large and complicated. To improve game play some areas will be grouped in twos or threes. Around 60-70 territories is the goal. 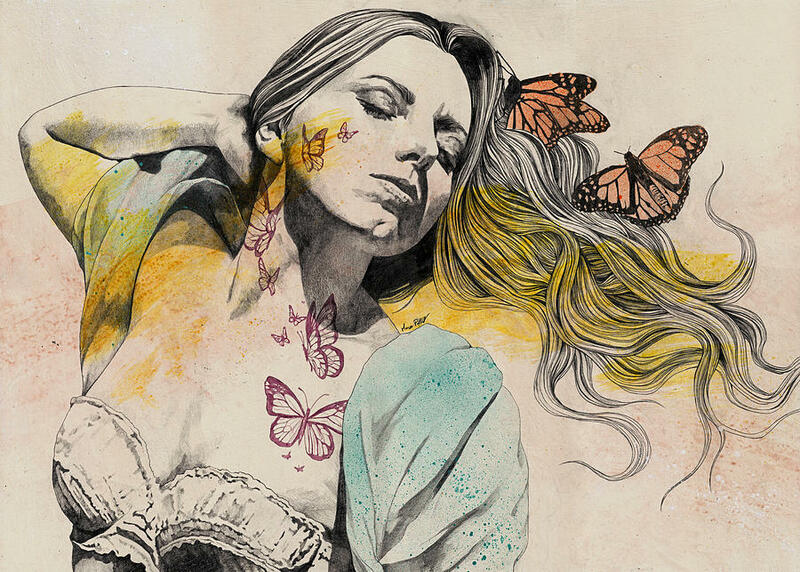 You are the mapmaker so you decide. 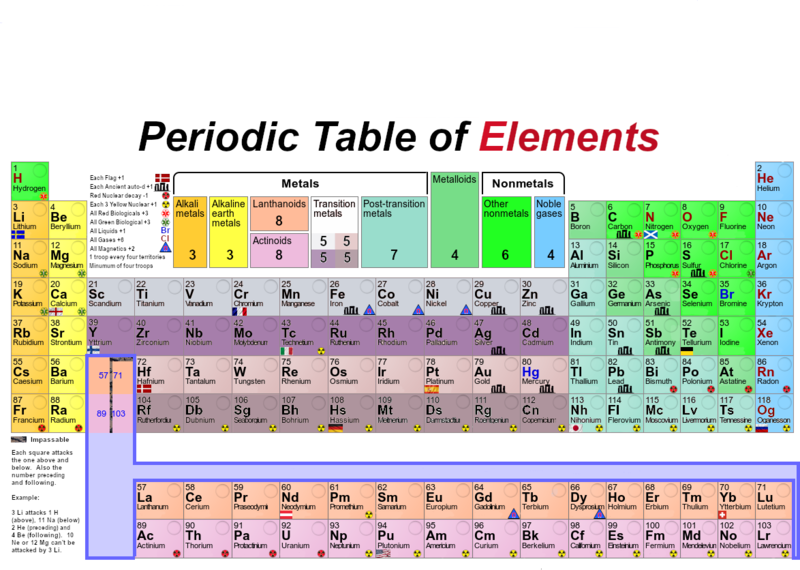 But when I look at the periodic table, and imagine a risk map out of it, I really don't think 118 regions is too much. What is the issue with it ? To build bonus ? I think the map will be very clear, thus 118 territories won't be an issue for the players. In think almost the same than Done, If I'll play this kind of map, I'd like to be able to reach any elements. SOmething else, when I see this link you sent about Ptable : Did you try to change the temperatures? It also change colors of the square depending if they're solid, liquid or gaz. Maybe you could think about a gameplay for that! you could set a thermometer aside the periodic table. thermometer is set with different temperatures (could be starting points). Then you could have 12 differents T°. Depending the temperature you own, your bonuses are not set the same, and can be a part of somebody else's bonus. One element can fit into your GAZ bonus because your starting point is 256°F (just an example, I didn't check ). But it is also part of the SOLID bonus for another player because he own the 187°F starting point. I like the changes you've made so far. However, just as a procedural thing, I would like to see you maintain an archive of previous versions as most mapmakers do. For instance, I see you've now ruled out the round version. Which is fine, but you've also removed the image. So now, someone who comes upon this thread for the first time will have no idea about what that discussion was about. Especially as you go through more versions, it will be interesting for people to follow the progression and see what was changed with each succeeding version. You will notice that back when the Foundry was a going concern, most mapmakers did this (maintain an archive) although sadly a lot of the links are now broken. Ok, reposted the round map link. Also, we'll use all 118 territories! The continents are clear. Bonuses are easy to calculate. I'm working on the placement of extra bonuses. Should be nice. Up down, left right number order. So, Mg #13 can attack 11, 13 , 4 and 20. Francine 87 can attack 86, 88 and 55. Each player will get 3 totally random starting terr. I'm thinking each box should have the atomic number, symbol, troop circle and area for 1 special symbol (flag, MA, Radioactive, or Ancient. there is clearly some interest here, so let's do what we can to move this project to the next step. the main thing needed is an image produced by u, to which u'll give a version number. at this stage, it can be hand-drawn or on software. this is so we can see the things to which u're referring. are u basing ur bonuses on an image that is NOT one of the three images that u've posted? we have actinoids, so lanthanoids, not lanthanides, must accompany them. there is potentially some doubt about movement from the actinoids and lanthanoids, for example can 97-Bk and 69-Tm assault 65-Tb and 39-Y respectively? although i'm expecting the answers to be "yes" and "no", ur confirmation is required, as some tables are drawn differently from others. 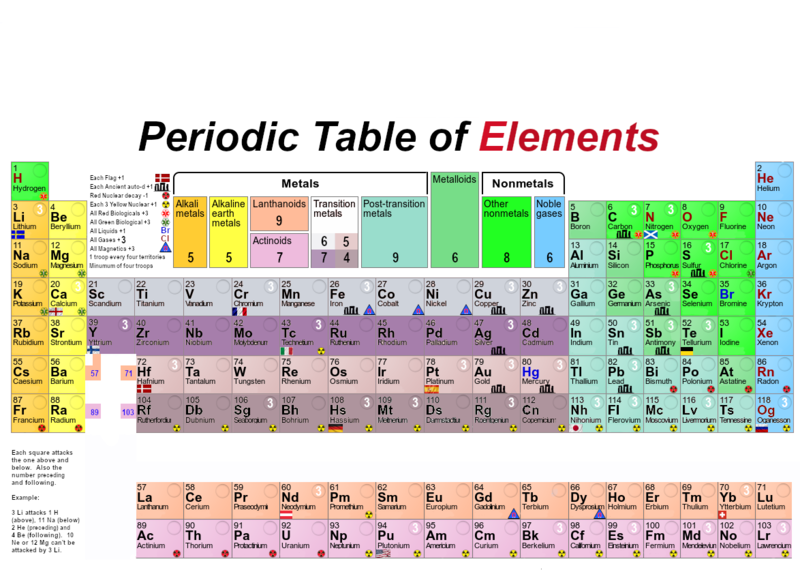 do u call it the periodic chart? all of ur links call it the periodic table. if elements is the name of the map, then make it the first word in the title. I think periodic table would be a more appropriate name. Hope you choose that one ! For what it’s worth I like this idea. iancanton wrote: there is clearly some interest here, so let's do what we can to move this project to the next step. Map Version 1 is now the working map. Yes, 97 will assault 65. 69 won't assault 39. Map title will be either Elements or Periodic War. Thinking it over and getting input. More smaller bonuses would be better than the current setup. I know I'm outspoken on that, but it's really the only thing that would make me care. DoomYoshi wrote: More smaller bonuses would be better than the current setup. I know I'm outspoken on that, but it's really the only thing that would make me care. Please add more of your thoughts. The map is in the early stages and bonuses can change. 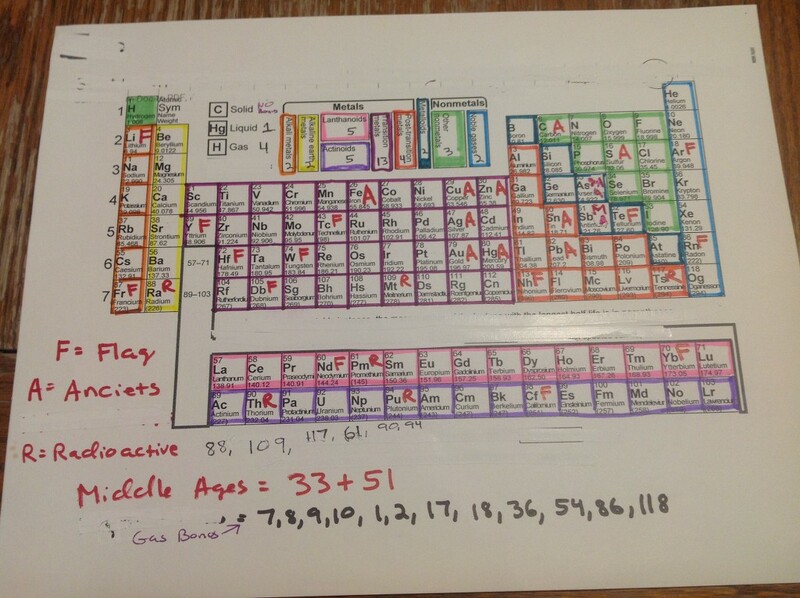 Just to be sure is it clear each flag, Ancients, radioactive and Middle Ages marker is +1? So, 32 of the 118 terr (27%) are +1 bonuses. Do you think that is too low? It was written early in the thread but isn't on Map Version 1. 6 Radiation symbol +1 each"
Thanks I didn't notice that. I think it's a great idea! as we have an image, this map is hereby [moved] into the drafting room proper. why are there only 6 radioactive element bonuses? 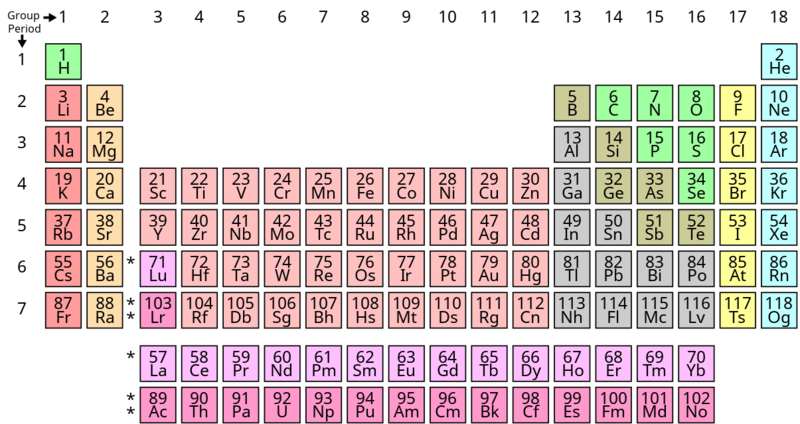 everything with brackets around the atomic weight, such as 43-Tc and 84-Po, is highly radioactive. iancanton wrote: as we have an image, this map is hereby [moved] into the drafting room proper. Yes. Numbers 43, 61 and 83-118 are radioactive elements. We could add all the radioactive elements. It can be done. 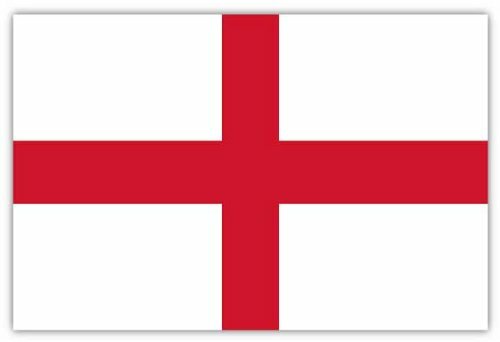 If we also add all the flags, Ancients and other symbols. The map might become cluttered. This is a game of course. 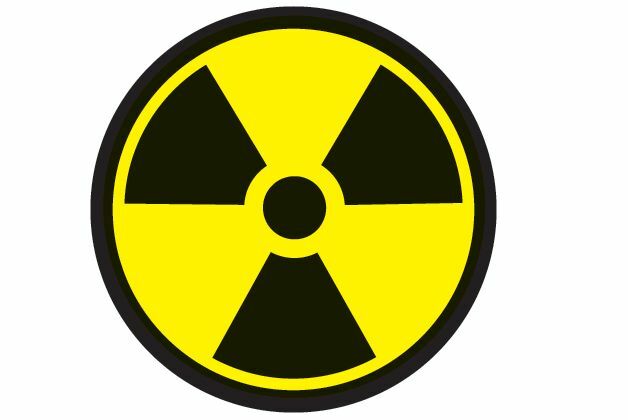 A sampling of the radioactive elements, flags and other symbols should add interest and encourage gameplay. CC players could always research more on their own. The 6 radioactive elements were chosen because I needed to balance out certain areas. We could add more but they would be worth less. If we triple the number to 18 then every 3 is +1. This might be cool. All 38. Every 6 is +1. These would be so worthless they might be a hindrance. HitRed wrote: Yes, 97 will assault 65. 69 won't assault 39.
i strongly recommend splitting the transition metals into periods 4, 5, 6 and 7, as a single bonus of +13 for holding all 38 of them will be ignored in almost all games. HitRed wrote: We could add all the radioactive elements. It can be done. 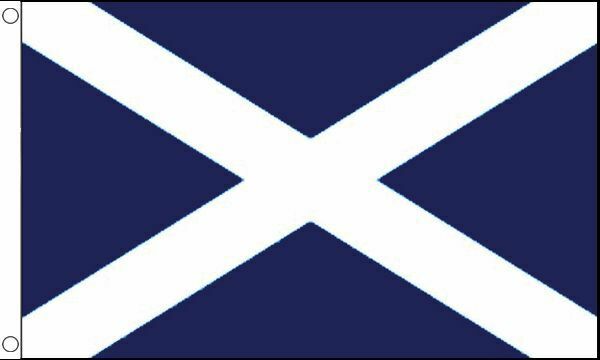 If we also add all the flags, Ancients and other symbols. The map might become cluttered. the map need not become cluttered, since flags and ancients are mutually exclusive, while we can denote radioactivity by an inner glow, for example, rather than by a radiation symbol. HitRed wrote: The 6 radioactive elements were chosen because I needed to balance out certain areas. if we show all radioactive elements as being radioactive, then why would they be worth less than +1 for every 3? there are 38 radioactive elements, of which 10 occur in nature and 28 are artificial. this forms a neat division into two bonus groups, which can be denoted visually by different glows. to represent radioactive decay, the radioelements can decay by -1 per turn.